Helen, the youngest of three children was born in Cardiff in July 1978. She graduated with a Bachelor of Divinity from Cardiff University in 1999. Due to her maiden name she was one of the last graduates in the last century ! Helen later became a part time theology lecturer working for Cardiff University, Lampeter University and in, what was, Trinity College Carmarthen. She also worked as an external marker for Spurgeon's Theological College in London and she delivered courses for the Workers Education Association. 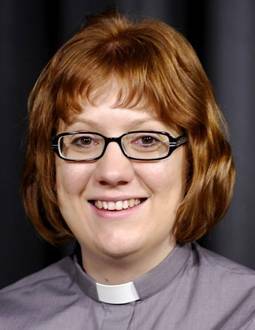 She was ordained Deacon in Llandaff Cathedral in June of 2009. In this month she also gained her Master of Theology from Cardiff University. Helen served in the parish of Penarth, All Saints. In 2010 she was ordained priest in Llandaff Cathedral. In November 2010 Helen moved with her husband Ian to serve in the Diocese of Swansea and Brecon serving in Llandrindod Wells, Gowerton and now in Central Swansea. Helen is an associate priest in the parish and she also works as the Diocesan Director of Education, a post which she took up in September 2011. Helen loves spending time with her family including her husband Ian, step- daughter Jessica, Son in law Gary and grandchildren Jack, Ryan and Katie. She also enjoys reading, playing the piano, sewing, drinking coffee and all things pink !